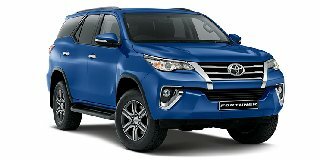 Toyota Fortuner 2.7 VVTi RB 6AT tougher yet classy. The Toyota Fortuner comes equipped with a Push Start system feature that ensures the engine starts at a push of a button and confirming that there is no holdup in getting your vehicle on the road. Once you are on the move, Auto Door Lock is actuated and conveniently locks the doors preventing entry from the outside. Child Lock is also available to ensure that there are absolutely no accidents with back-seat, passenger door safety. On all models, anti-theft systems function mutely in the context, the antitheft system includes an autonomously powered siren, an advanced immobiliser, as well as an ultrasonic glass-breaking and intrusion sensor.